Looking for something new to feed your family? 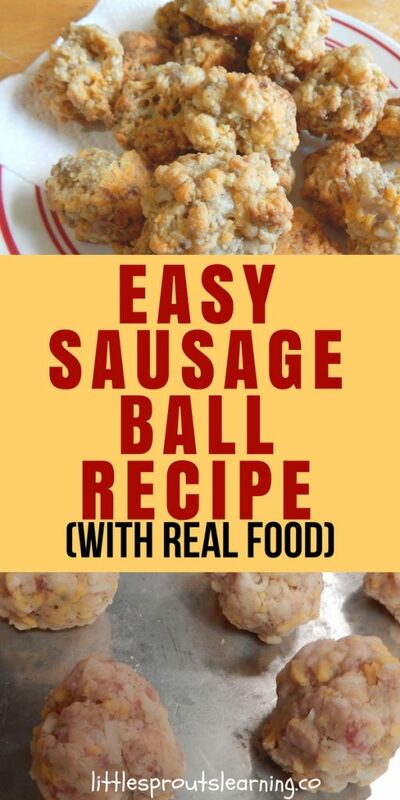 This sausage ball recipe is easy, made with real food and kids love them (adults too!) Bake big batches of them and freeze them for quick and easy meals. I wanted to add some new menu items to my childcare menu and I thought of the idea of a sausage ball recipe. People serve them as hors d’oeuvres at parties, but they are really just cheese and sausage biscuits. I knew they were incredibly easy to make, but they use Bisquick baking mix and I don’t use boxed foods like that. Pre-made foods are full of unnecessary chemicals, some of which I am allergic to, but all of which are unhealthy for our bodies. I wanted to come up with a plan to make these yummy flavor packed nuggets without the mix. Next, I pulled out an old recipe for homemade “master mix” from an old cookbook, Make a Mix Cookery that I refer to often to replace processed ingredients. For our new meal plan requirements, we must serve at least one whole grain per day, so I wanted to make my sausage balls with whole grains. Click here to see the new meal plan requirements. You could use these sausage balls for breakfast, lunch or even snack. Then I divided up the recipe so I wouldn’t have any leftover baking mix to deal with, I could just dump it in the mixer and mix. 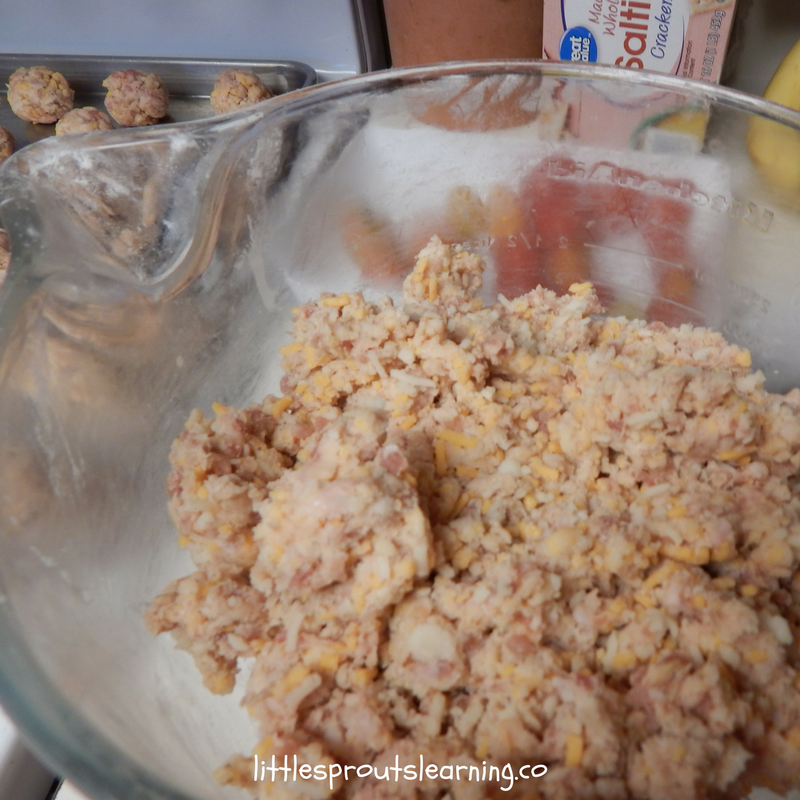 The mixer mixes the sausage and cheese right in for you. It easy peasy to make these sausage balls with real food. You can also add grated vegetables at this point to make your balls even healthier. I like to add green powder to get the kids an un-detectable serving of greens. Click here to learn more about that. You could also add a cup or two of grated carrots, broccoli or other vegetable. If you use something with lots of moisture like zucchini, you’ll have to add more dry ingredients because they will make your dough too wet. After you dump everything in the bowl and let the mixer do the work, you scoop your easy sausage balls into one inch balls onto a cookie sheet one inch apart. Then bake them off. These easy sausage balls are great for the freezer. I love cooking easy freezer foods for a faster meal later. 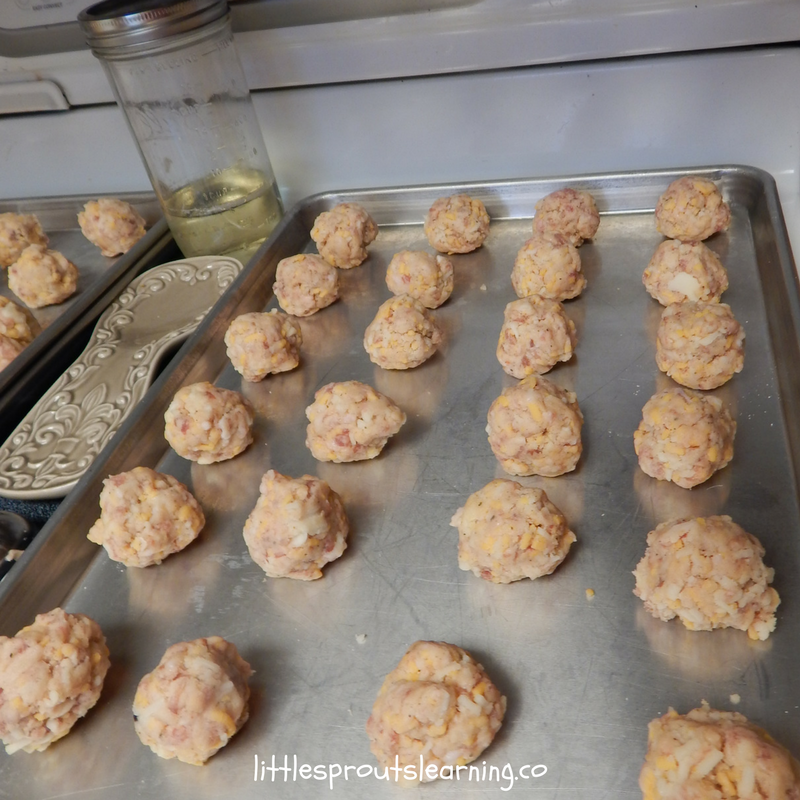 You can freeze them raw and bake them as needed or bake the sausage balls and freeze them cooked. Either way, they turn out great. I am planning to lay my frozen sausage balls out on a cookie sheet and let them thaw before I bake them. This easy sausage ball recipe is so fast and simple. It’s super tasty too. I got a hearty thumbs up on the sausage balls from all the kids and my husband. He was super excited to come home and tell me he loved them after I sent them in his lunch. I plan to keep making two batches at a time. Since I already have to get a bowl dirty, I might as well use it twice in a row. If you need help figuring out how to get your kids to eat healthy, click here. Check out the blog for lots of other healthy recipes for kids. 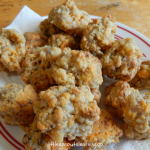 I hope you try these super easy sausage balls and keep this recipe to use with your family. Let me know what you think! Super easy sausage balls made with real, healthy ingredients. In large bowl of stand mixer, add flours, baking powder and soda, cream of tartar, salt and pepper. Mix in stand mixer until butter is pea sized. Mix with mixer until combined.